Springtime: that special time of year when we try to consume as much asparagus as possible before summer hits and we’re forced to eat all the zucchini we grow. Combine that with Dinnertime: that time of day when I usually want to take a nap but am forced to feed myself so my blood sugar doesn’t plummet and turn me crazier than I already am. 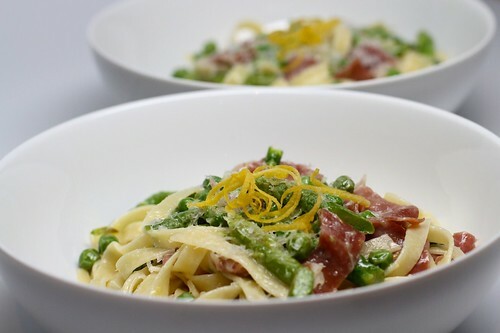 So the requirements are asparagus + quick and easy, and the answer is pasta with asparagus, peas and prosciutto. Okay, and some other, slightly less healthy things, like butter and cream and cheese. But only a little. And did I mention all the peas? The best part is that everything happens in one pot in about 20 minutes, and that includes the time you spend waiting for the water to boil. You blanch the veg in the same boiling water in which you cook the pasta. Then you drain, and return to the same pot to toss everything around with some butter and cream. 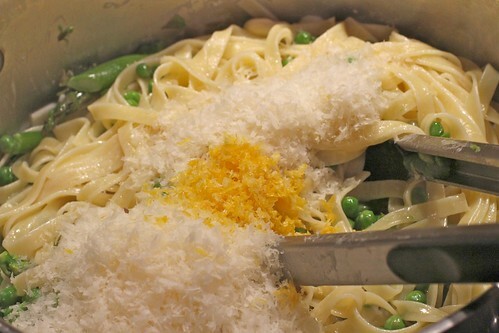 And some cheese and lemon zest. 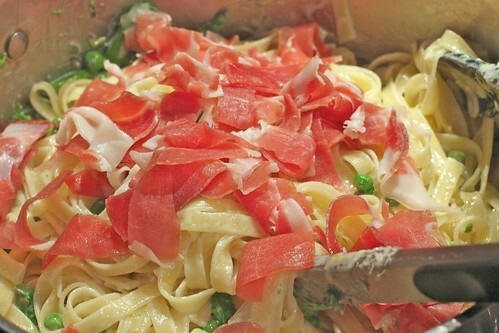 And some prosciutto, because dinner isn’t really dinner without pork. Then you fix yourself a glass of lemonade, and sit down to dinner. And feel good that you’ve only dirtied one pot, and you’ll totally have time to straighten up the kitchen in time to relax for a little while and maybe watch some of The Voice. Yes, maybe I watch it sometimes, if I catch it. Shut up. Heat a large pot of water to boiling. Add the pasta. 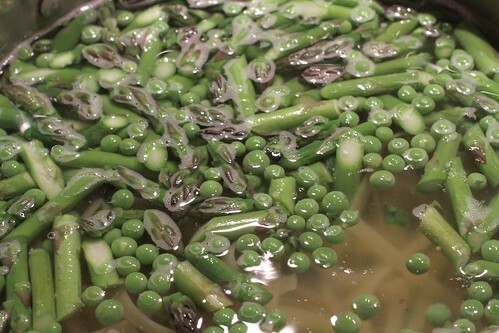 When the pasta has 5 minutes left to cook, add the asparagus and peas to the pot. When the pasta and veg are done, drain them and return them to the pot. 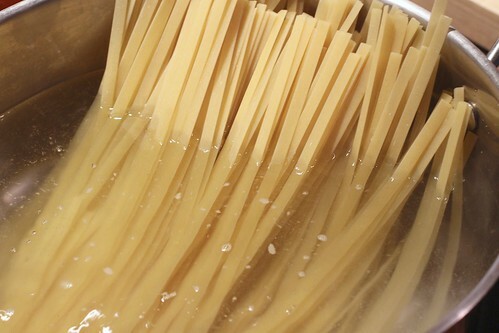 With tongs, toss the hot pasta with the butter, cream and cheese until everything is well coated. 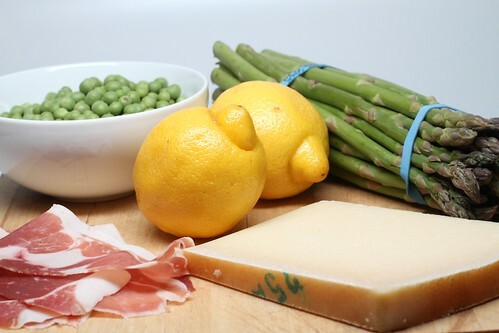 Toss in the prosciutto and lemon zest. Serve immediately, passing more cheese at the table. I make a version of this a lot with mushrooms, but they require sauteeing and that requires another pan. 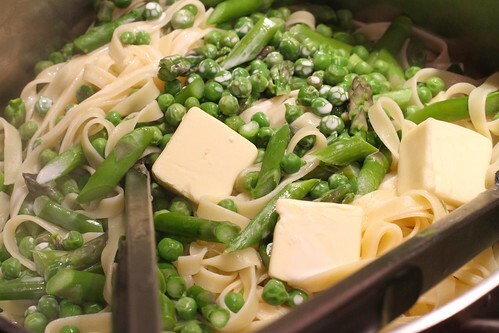 I am loving this using asparagus thing (my kid freaking loves it) and making it in one pan. Dinner tomorrow? DONE. Thanks. The Voice has this girl from here on it. Her dad (who owns all the practice spaces in town and lets her live at one of them for free) keeps trying to make her happen as an artist, but nothing sticks, so she just keeps changing her genre. Her audition apparently wasn’t exciting enough to show more than a snippet, though – ha! Now you have a reason to watch: seeing if Casey Desmond can get anywhere. Ok fine I watch The Voice too. satisfied? I also watched Beauty and the Geek, one season of Coyote Ugly auditions, and one season of The Dallas Cowboy Cheerleaders. My DVR is set on permanent record for SYTYCD and “V”, and I regularly tape Bones, Castle, and NCIS. There, I’ve confessed, all my ugly little secrets are out. Btw, the dinner looks great! With our new 4×12 asparagus bed, next year we should have plenty to go along with our sugarsnap peas and our snow peas. 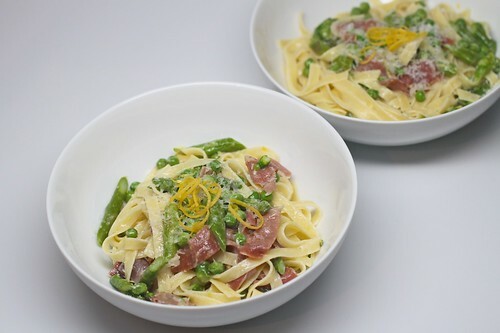 I made pasta with creamy sauce, asparagus and the last of the Easter ham for dinner last night, only to come on here and see something so similar! Yum! I like the name the best… happy food! This. Looks. Amazing. The best part is I have almost everything on hand now. The only exception is bacon instead of prosciutto. In our house, prosciutto is a luxery, bacon is a necessity. Do any of you have any suggestions for the grating cheese would be good for this dish? wow, this looks so good and super easy. I think the lemon zest is the money ingredient. I mean, it all looks good, but I can see how the zest makes it pop. I guess I’m never aware of the amount of dishes I accumulate, due to my maid (read: my fiance lol). But I bet he would be thankful for this – both dinner-wise and dishes-wise! Sounds fantastic!